In 2016 the British non-food retail sector continued to grow on the back of a robust increase in private consumption (up 2.8%). Consumer spending has been the engine of UK economic growth over the last couple of years, supported by relatively high employment and low inflation. According to the British Statistics Office ONS, non-food retail sales volumes increased 4.3% year-on-year in December 2016, and many retailers have posted very positive results over the Christmas period. The amount spent on non-food items increased 1.2%, while average store prices rose 0.9%. Online sales, accounting for approximately 15% of retail spending, were once again particularly buoyant, rising 21.3% year-on-year, which no doubt is putting pressure on companies with a more traditional bricks-and-mortar presence. 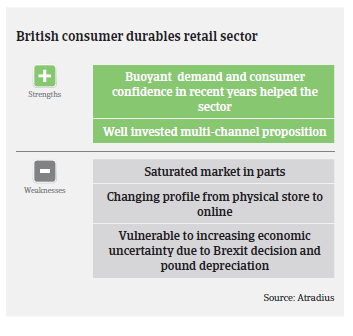 2017 is expected to be a more challenging year for consumer durables retail, as the weaker British pound is putting upward pressure on prices, and uncertainty surrounding the UK’s future relationship with the EU is weighing on investment spending. This will likely cause businesses to slow hiring and wage growth, with real wages expected to start decreasing over the next six months, which will result in a reduction of disposable income. Higher inflation (2017 forecast: up 2.6%) will make consumer goods more expensive, both hurting consumer spending and weighing on GDP growth. Private consumption is expected to grow 1.6% in 2017, and UK retail sales growth is expected to slow down to 0.6%, after increasing 2.5% in 2016. Higher costs for imported materials due to the British pound depreciation have already begun to force retailers to reconsider their sources for raw materials and their pricing of goods. The retailers’ biggest challenge ahead will be achieving real growth while contending with increased prices as import costs are passed on to customers. In January 2017 furniture prices rose 2.5% reaching a five-year high. Having been a buoyant market in recent years, it is expected that price increases will negatively impact furniture sales over the next 12 months. At the same time, sales of domestic appliances are also expected to be impacted by increasing input prices, although to what extent is not yet known, given the challenge faced by retailers to keep prices competitive. In 2016 unseasonal weather conditions resulted in lengthy discount periods on the high street in order to sell seasonal stock, further contributing to margin pressure, and this is expected to continue well into 2017. Additionally, in April 2017 the National Living Wage will be increased to GBP 7.50 an hour for persons aged 25 and older. As many brick-and-mortar retail businesses rely heavily on staff paid towards the lower end of the scale, those higher labour costs could force them to consider their cost base and store portfolios as a result, closing outlets that are no longer covering their costs or are not sufficiently profitable to keep open. On average, payments in the consumer durables retail industry take 60 days, and while we do not expect a significant increase in payment delays in the foreseeable future, a small increase due to the upcoming challenges is rather probable. 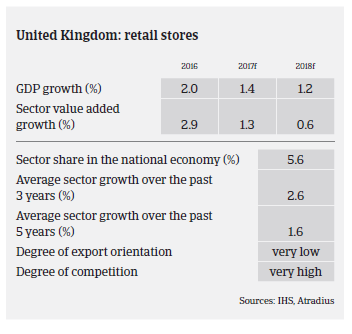 As the British retail market remains highly competitive and faces increasing costs, changing shopping behaviour (i.e. increasing price sensitivity and a growing share of online retail sales) and lower consumer spending, insolvencies are expected to increase slightly along with the rising economic uncertainty. We maintain a neutral approach to underwriting in the consumer durables segment. 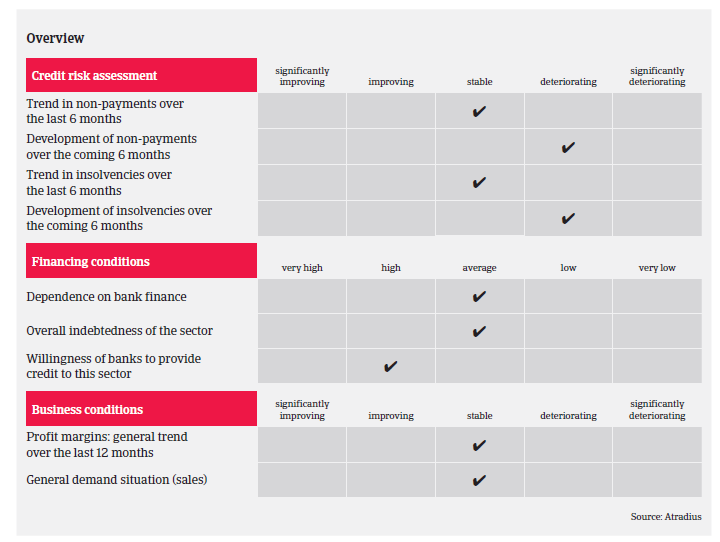 We continue to monitor developments in the sector on a regular basis, making as much contact with buyers as possible, in particular with those who heavily rely on sourcing materials from overseas, those who have large store portfolios, high levels of debt to service and those whose financials are showing signs of deterioration. In general there is a willingness for retailers to share confidential financial information, allowing us to make the best informed decision. Seasonality remains a major factor in the British retail sector, particularly around the Christmas period. We therefore actively encourage our customers to consider seasonal peak requirements well in advance, so that we can ensure that we are able to satisfy their demand.